Okra / Ladies Finger is an ideal vegetable for weight loss.The fiber of okra has many superior qualities in maintaining the health of the gastro-intestinal tract. 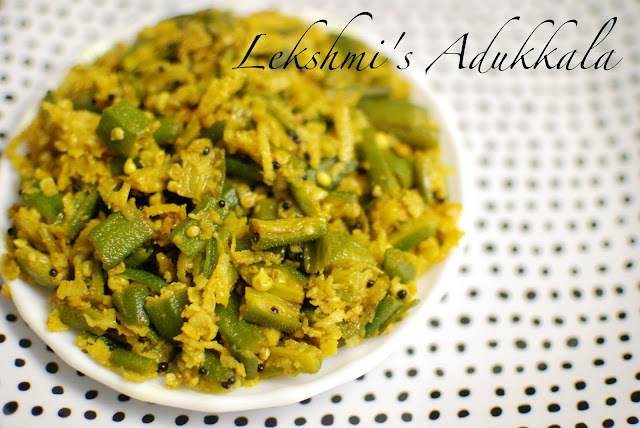 Vendakka Thoran / Okra Stir Fry is a delicious thoran which can be served with rice. Add chopped Okra and Green Chilli and saute it. Stir well and slow down the flame and let it cook. When Okra is cooked well add grated coconut and curry leaves. Stir for 2 minutes and remove from fire. never added coconut with okra, looks very delicious..